Lawyers in Ontario, Michigan and California have notified us that they received an email from the purported Hitomi Jefferson looking to retain them with regards to a collecting overdue payments resulting from a separation agreement. I wish to hire your legal service to help me file a petition against my ex-husband for failure to make court ordered payment for Child Support, Alimony and Medical Support. Please advise. 1. The “Separation Agreement” says the marriage was at the Uijeongbu District Court in Nagoya. Of course Uijeongbu is a suburb of Seoul, Korea, not a Japanese city. 2. The “Seal” of the Nagasaki District Court is in English and Hangul (Korean characters). 3. The information line at the bottom of a very realistic Passport page is entirely blank. 4. The attorney names for both parties shown on the “Divorce Decree” are Korean, not Japanese. I was curious about how the scam would work. I find it hard to believe that any experienced attorney would wire uncleared funds from his/her trust account, but I guess the fraudsters think it would happen. 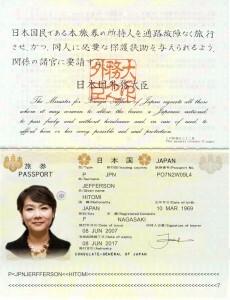 In addition to the inconsistencies noted by Mr. Zukerman, the separation agreement and passport contain identical “Hitomi” signatures. Suspecting a fraud, I requested confirmed contact information for “Goldstein” in the local area, and heard nothing further from the thieves. I am a new attorney at an established law firm in ND. Received this email over the weekend. This is the 3 such scam email that has been sent my way. Can your law firm handle contempt petition against my ex-husband for failure to make court ordered payments resulting from dissolution of marriage? I received the same email. Initially I was skeptical but sent a retainer and fee quote and got a response agreeing to everything and requesting a fee agreement. I sent the email to a friend and we both found it to be off. While we didn’t bother checking the court or the characters on the documents, I requested all the identification information I could think of on the “husband” to see if I’d get a response, and we googled the “wife’s” name and found all the scam site warnings. Clearly at this point, we’re just seeing how far this will go…without sending any banking info, of course. You previously hired us for this case, don’t you remember? Your ex-husband, Goldstein Jefferson, has already paid us the past due $544,700.00 in back support that he owed you. After deducting our normal fees, you owe us $4,289.56. As a client bonus exclusively for you, we are not charging for this email. Please remit a check for the amount to Hugh Lose Dewey, Esq. within the next five business days. I am a CPA that is involved in collaborative law, I receive at least one usually two of these email weekly. I have received dozens of these solicitations. The first one I thought might be legitimate. I received the cashiers check and took it to the bank it was drawn on and did not deposit it into my Trust account. The purported cashiers check was a carefully crafted counterfeit that the teller would have accepted. I asked for the manager to check it and she verified it was fraudulent. Please report these fraudulent solicitations, and beware of others besides Ms. Jefferson. We received a similar email but from Fumiko somebody or other but we also received a cashiers check for the amount “owed” from “husband”. He was nice enough to send an unsigned and unaddressed memo with it. His overnight mail address was from a local hospital and an American name, but postmarked in Canada. Called Chase who said the cashier’s check was a fraud because it was missing many things a legitimate cashier’s check would have ordinarily. It certainly looked legitimate. Wrote ‘client’ and told her we didn’t have time to get to the bank, but we would endorse it to her and forward the cashier’s check to her once she had paid her fee. Needless to say we haven’t heard from her again. Knowing it was a scam, it was a nice diversion from an otherwise busy day. I received similar emails. My personal favorite was the return address used by the husband on the Express Mail. They clearly did not realize they used a home address two doors down from mine that was owned by an East Indian family and currently listed for sale. And, as mentioned in a previous post, the check was sent from Canada. Finally, the Express Mail was sent after I told them to go away in a rather caustic email. I receive this type of scam email almost every week. When I received the first one, I was almost caught in the scam – I got a counterfeit check by Fedex and deposited it into my bank account – but, luckily, my bank didn’t cash the check. The check was on hold for several days and returned to me because it was fake. “My Ex Husband has violated court order in payment of child, spousal and medical support. Please advise if you handle such case. Now I have received it from Mrs. Paris and Mr. Michael Jun. I asked him to send the payment directly to Mrs. Paris. My name is Michael Jun . I have tried calling you, but i could not get through. I am writing you this email in respect of the email i got from my ex-wife Paris.I know that there has been some default on my side to keep to the “Settlement agreement” and remit funds to Paris as agreed upon.But due to the economic meltdown, I am unable to keep to this agreeement.Please I do not want to go to court or face any form of litigation. Therefore, In regard of your client Paris, I am willing to send you a part-payment from the few savings that I have. I intend to pay the balance in 4 weeks from the day of my first disbursement to you.Please be considerate and accept my offer. I look forward to hearing from you soonest.